Definition at line 75 of file llcamera.h. Definition at line 79 of file llcamera.h. Definition at line 86 of file llcamera.h. Definition at line 93 of file llcamera.h. Definition at line 98 of file llcamera.h. Definition at line 39 of file llcamera.cpp. Definition at line 52 of file llcamera.cpp. References calculateFrustumPlanes(), DEFAULT_FAR_PLANE, mAspect, MAX_ASPECT_RATIO, MAX_FAR_PLANE, MAX_FIELD_OF_VIEW, MAX_NEAR_PLANE, mFarPlane, MIN_ASPECT_RATIO, MIN_FAR_PLANE, MIN_FIELD_OF_VIEW, MIN_NEAR_PLANE, mNearPlane, and mView. Definition at line 153 of file llcamera.cpp. References d, i, mAgentPlaneMask, mAgentPlanes, mask, n, p, S32, and LLVector3::scaledVec(). Referenced by LLOctreeCull::checkObjects(), earlyFail(), LLSpatialBridge::setVisible(), and LLOctreeCull::traverse(). Definition at line 481 of file llcamera.cpp. References i, mAgentFrustum, mAgentPlaneMask, mAgentPlanes, mask, n, p, and planeFromPoints(). Referenced by LLViewerWindow::hitObjectOrLandGlobalAsync(), and LLViewerCamera::updateFrustumPlanes(). Definition at line 534 of file llcamera.cpp. References a, b, c, f, mFarPlane, mFrustCenter, mFrustRadiusSquared, mLocalPlanes, PLANE_BOTTOM, PLANE_LEFT, PLANE_RIGHT, PLANE_TOP, LLPlane::setVec(), LLCoordFrame::transformToAbsolute(), and X_AXIS. Definition at line 455 of file llcamera.cpp. References bottom, f, left, mAspect, mFarPlane, mView, right, tanf, and top. Referenced by calculateFrustumPlanesFromWindow(), LLCamera(), setAspect(), setFar(), setNear(), setView(), and setViewHeightInPixels(). Definition at line 564 of file llcamera.cpp. References bottom, calculateFrustumPlanes(), f, left, mAspect, mFarPlane, mView, right, tanf, and top. Definition at line 578 of file llcamera.cpp. References d, f, getYaw(), HORIZ_PLANE_LEFT, HORIZ_PLANE_RIGHT, mHorizPlanes, mLocalPlanes, mNearPlane, LLCoordFrame::mOrigin, mWorldPlanePos, mWorldPlanes, LLCoordFrame::mXAxis, LLVector3::normVec(), p, PLANE_LEFT, PLANE_RIGHT, LLCoordFrame::rotateToAbsolute(), LLVector3::rotVec(), and LLCoordFrame::yaw(). Definition at line 135 of file llcamera.h. Referenced by LLVOAvatar::buildSkeleton(), LLAgent::calcCustomizeAvatarUIOffset(), LLViewerCamera::calcProjection(), LLNetMap::draw(), LLWorldMapView::drawFrustum(), LLManip::getMousePointOnPlaneGlobal(), LLToolsLookAtSelection::handleEvent(), LLManipTranslate::highlightManipulators(), LLManipScale::highlightManipulators(), LLViewerWindow::mouseDirectionCamera(), LLManip::nearestPointOnLineFromMouse(), operator<<(), LLDynamicTexture::postRender(), LLDynamicTexture::preRender(), LLViewerWindow::renderSelections(), LLSelectMgr::renderSilhouettes(), LLVOAvatar::setPixelAreaAndAngle(), setup_hud_matrices(), LLVOAvatar::updateCharacter(), and LLHUDText::updateScreenPos(). Definition at line 137 of file llcamera.h. Referenced by LLNetMap::draw(), LLWorldMapView::drawFrustum(), LLPipeline::generateReflectionMap(), LLViewerCamera::getProjection(), LLToolSelectRect::handleRectangleSelection(), LLViewerWindow::hitObjectOrLandGlobalAsync(), LLViewerWindow::hitUIElementAsync(), LLViewerCamera::LLViewerCamera(), LLViewerWindow::rawSnapshot(), LLTracker::renderBeacon(), LLPipeline::renderGeom(), LLViewerCamera::setPerspective(), LLViewerCamera::updateFrustumPlanes(), LLVOSky::updateSky(), and LLWorld::updateVisibilities(). Definition at line 136 of file llcamera.h. Referenced by LLViewerCamera::calcProjection(), LLToolSelectRect::handleRectangleSelection(), LLViewerWindow::hitObjectOrLandGlobalAsync(), LLViewerWindow::hitUIElementAsync(), LLMorphView::initialize(), LLDynamicTexture::postRender(), LLDynamicTexture::preRender(), LLViewerWindow::rawSnapshot(), raycast_for_new_obj_pos(), LLViewerCamera::setPerspective(), LLViewerWindow::setup3DRender(), LLVOSky::updateFog(), LLVOAvatar::updateHeadOffset(), and LLHUDText::updateVisibility(). Definition at line 143 of file llcamera.h. References LLCoordFrame::mXAxis, sqrtf, VX, VY, and VZ. Definition at line 133 of file llcamera.h. Referenced by LLAgent::calcCustomizeAvatarUIOffset(), LLViewerCamera::calcProjection(), LLVolumeImplFlexible::doIdleUpdate(), LLNetMap::draw(), LLWorldMapView::drawFrustum(), LLViewerCamera::getPixelVectors(), LLToolsLookAtSelection::handleEvent(), LLViewZoomDefault::handleEvent(), LLDrawable::incrementVisible(), LLViewerWindow::mouseDirectionCamera(), LLViewerWindow::mouseDirectionGlobal(), operator<<(), LLDynamicTexture::postRender(), LLDynamicTexture::preRender(), LLManipScale::render(), LLSelectNode::renderOneSilhouette(), LLManipTranslate::renderSnapGuides(), LLManipTranslate::renderTranslationHandles(), LLViewerCamera::setPerspective(), LLVOTree::setPixelAreaAndAngle(), LLVOGrass::setPixelAreaAndAngle(), LLDebugText::update(), LLViewerJoystick::updateCamera(), and LLManipRotate::updateVisiblity(). Definition at line 134 of file llcamera.h. Referenced by LLViewerCamera::getPixelVectors(), LLManipScale::render(), LLManipTranslate::renderSnapGuides(), LLManipTranslate::renderTranslationHandles(), LLVOTree::setPixelAreaAndAngle(), LLVOGrass::setPixelAreaAndAngle(), LLVOAvatar::setPixelAreaAndAngle(), and LLManipRotate::updateVisiblity(). Definition at line 149 of file llcamera.h. Definition at line 150 of file llcamera.h. Definition at line 139 of file llcamera.h. References LLCoordFrame::mXAxis, VX, and VY. Definition at line 333 of file llcamera.cpp. References angle, f, LLVector3::magVec(), LLCoordFrame::mOrigin, mView, and mViewHeightInPixels. Definition at line 164 of file llcamera.h. Definition at line 138 of file llcamera.cpp. References mAspect, mFarPlane, mNearPlane, and mView. Definition at line 97 of file llcamera.cpp. References calculateFrustumPlanes(), mAspect, MAX_ASPECT_RATIO, and MIN_ASPECT_RATIO. Referenced by LLPanelDisplay::applyResolution(), LLViewerWindow::hitObjectOrLandGlobalAsync(), LLViewerWindow::hitUIElementAsync(), idle_startup(), LLAgent::init(), LLDynamicTexture::postRender(), LLDynamicTexture::preRender(), LLVisualParamHint::render(), LLImagePreviewSculpted::render(), LLImagePreviewAvatar::render(), and LLViewerWindow::reshape(). Definition at line 115 of file llcamera.cpp. References calculateFrustumPlanes(), MAX_FAR_PLANE, mFarPlane, and MIN_FAR_PLANE. Referenced by display_update_camera(), LLToolSelectRect::handleRectangleSelection(), LLViewerWindow::hitObjectOrLandGlobalAsync(), LLViewerWindow::hitUIElementAsync(), LLAgent::init(), LLSpatialPartition::processImagery(), and LLWorld::updateVisibilities(). Definition at line 177 of file llcamera.h. Definition at line 106 of file llcamera.cpp. References calculateFrustumPlanes(), MAX_NEAR_PLANE, MIN_NEAR_PLANE, and mNearPlane. Referenced by display(), LLToolSelectRect::handleRectangleSelection(), LLViewerWindow::hitObjectOrLandGlobalAsync(), LLViewerWindow::hitUIElementAsync(), LLAgent::init(), LLMorphView::initialize(), LLDynamicTexture::postRender(), LLDynamicTexture::preRender(), and LLMorphView::shutdown(). Definition at line 81 of file llcamera.cpp. References calculateFrustumPlanes(), MAX_FIELD_OF_VIEW, MIN_FIELD_OF_VIEW, and mView. Referenced by LLViewZoomDefault::handleEvent(), LLViewerWindow::hitObjectOrLandGlobalAsync(), LLViewerWindow::hitUIElementAsync(), LLAgent::init(), LLDynamicTexture::postRender(), LLDynamicTexture::preRender(), LLImagePreviewSculpted::render(), LLImagePreviewAvatar::render(), LLPreviewAnimation::render(), update_fov(), LLViewerJoystick::updateCamera(), and LLAgent::updateCamera(). Definition at line 89 of file llcamera.cpp. Referenced by idle_startup(), LLAgent::init(), and LLViewerWindow::reshape(). Definition at line 309 of file llcamera.cpp. References d, i, and mAgentPlanes. Referenced by LLToolSelectRect::handleRectangleSelection(), LLSpatialPartition::isVisible(), pointInFrustum(), sphereInFrustumFull(), LLWorld::updateVisibilities(), LLSurfacePatch::updateVisibility(), and LLHUDText::updateVisibility(). Definition at line 165 of file llcamera.h. Definition at line 213 of file llcamera.cpp. References FALSE, mFarPlane, MIN_NEAR_PLANE, mLocalPlanes, LLCoordFrame::mOrigin, LLCoordFrame::mXAxis, LLCoordFrame::mYAxis, LLCoordFrame::mZAxis, PLANE_BOTTOM, PLANE_LEFT, PLANE_RIGHT, PLANE_TOP, TRUE, VX, VY, VZ, x, y, and z. Definition at line 194 of file llcamera.cpp. Definition at line 365 of file llcamera.cpp. 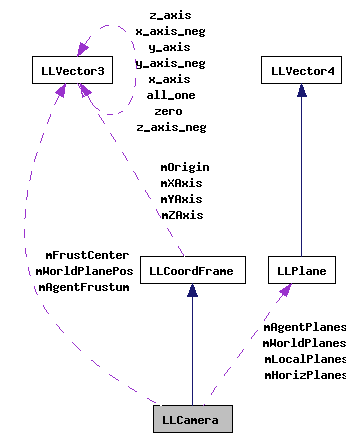 References LLPlane::dist(), LLVector3::magVec(), mFixedDistance, LLCoordFrame::mOrigin, mWorldPlanes, LLCoordFrame::mXAxis, p, and PLANE_NUM. Definition at line 397 of file llcamera.cpp. References LLPlane::dist(), HORIZ_PLANE_NUM, LLVector3::magVec(), mFixedDistance, mHorizPlanes, LLCoordFrame::mOrigin, and p.
Definition at line 126 of file llcamera.cpp. Definition at line 424 of file llcamera.cpp. Definition at line 121 of file llcamera.h. Referenced by calcAgentFrustumPlanes(), and LLViewerWindow::hitObjectOrLandGlobalAsync(). Definition at line 118 of file llcamera.h. Referenced by AABBInFrustum(), and calcAgentFrustumPlanes(). Definition at line 117 of file llcamera.h. Referenced by AABBInFrustum(), calcAgentFrustumPlanes(), and sphereInFrustum(). Definition at line 106 of file llcamera.h. Referenced by calculateFrustumPlanes(), calculateFrustumPlanesFromWindow(), getAspect(), LLCamera(), readFrustumFromBuffer(), setAspect(), LLViewerCamera::updateCameraLocation(), and writeFrustumToBuffer(). Definition at line 109 of file llcamera.h. Referenced by calculateFrustumPlanes(), calculateFrustumPlanesFromWindow(), getFar(), LLCamera(), operator<<(), readFrustumFromBuffer(), setFar(), sphereInFrustumOld(), sphereInFrustumQuick(), and writeFrustumToBuffer(). Definition at line 111 of file llcamera.h. Referenced by setFixedDistance(), visibleDistance(), and visibleHorizDistance(). Definition at line 112 of file llcamera.h. Referenced by calculateFrustumPlanes(), and sphereInFrustumQuick(). Definition at line 113 of file llcamera.h. Definition at line 116 of file llcamera.h. Referenced by calculateWorldFrustumPlanes(), and visibleHorizDistance(). Definition at line 110 of file llcamera.h. Referenced by calculateFrustumPlanes(), calculateWorldFrustumPlanes(), operator<<(), and sphereInFrustumOld(). Definition at line 108 of file llcamera.h. Referenced by calculateWorldFrustumPlanes(), getNear(), LLCamera(), operator<<(), readFrustumFromBuffer(), setNear(), and writeFrustumToBuffer(). Definition at line 105 of file llcamera.h. Referenced by calculateFrustumPlanes(), calculateFrustumPlanesFromWindow(), getView(), heightInPixels(), LLCamera(), readFrustumFromBuffer(), setView(), and writeFrustumToBuffer(). Definition at line 107 of file llcamera.h. Referenced by getViewHeightInPixels(), heightInPixels(), setViewHeightInPixels(), and LLViewerCamera::updateCameraLocation(). Definition at line 119 of file llcamera.h. Referenced by calculateWorldFrustumPlanes(), and getWorldPlanePos(). Definition at line 115 of file llcamera.h. Referenced by calculateWorldFrustumPlanes(), getWorldPlane(), and visibleDistance().